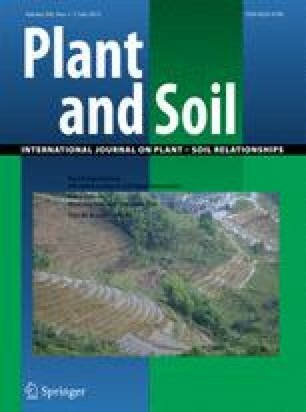 The objective of this study was to elucidate the composition of bacterial communities from the soil, and endosphere and phyllosphere of upper and lower leaves and clarify the responses to elevated CO2 and/or soil temperature. Using 454 pyrosequencing, the 16S rRNA gene was analyzed from various bacterial communities in a rice paddy that was exposed to different atmospheric CO2 concentrations (ambient, +200 μmol.mol−1) and soil temperatures (ambient, +2 °C). The treatments of elevated temperature and elevated CO2 plus temperature exerted significant influence on the structure of bacterial communities from the lower leaf endosphere. A significant influence of elevated CO2 plus temperature on the community structure was also observed in the upper leaf phyllosphere. The richness and diversity of bacterial communities from the lower leaf phyllosphere, upper leaf endosphere, and upper leaf phyllosphere were significantly affected by elevated CO2 plus temperature. However, we did not observe any significant influence of all climate change treatments (elevated CO2, elevated temperature, and their combination) on the richness, diversity, and structure of soil bacterial communities. We also did not observe any significant effect of the single factor, elevated CO2, on the structure of the leaf endosphere and phyllosphere bacterial communities. Enterobacteriaceae and Xanthomonadaceae were the most shifted phylotypes in response to elevated temperature and elevated CO2 plus temperature. Soil bacterial communities were more resistant to the tested climate change factors compare with foliar bacterial communities. Temperature was a more important factor in shaping the structure of foliar bacterial communities compared with CO2. The response of leaf-associated bacterial communities could be influenced by the leaf location (upper leaf or lower leaf) within the rice plants and by the habitats (leaf endosphere or phyllosphere). Gaidi Ren and Chunwu Zhu contributed equally to this work. The online version of this article (doi: 10.1007/s11104-015-2503-8) contains supplementary material, which is available to authorized users. This study was supported by National Basic Research Program of China (973 Program, 2014CB954500) and the National Science Foundation of China (40971153 and 41090281). The FACE/warming experiment was financially supported by the Ministry of Agriculture, Forestry and Fisheries, Japan, through a research project entitled “Development of technologies for mitigation and adaptation to climate change in Agricure, Forestry and Fisheries”. This work was also supported by the Distinguished Young Scholar Programme of Jiangsu Province (BK2012048). We would like to thank Drs. Justin Kuczynski, Martin Hartmann, Johan Bengtsson, K. Martin Eriksson, Zheng Wang, Qiong Wang, and Huayong Zhang for their assistance in bioinformatics analysis. We also thank the anonymous reviewers for their constructive suggestions that helped us to greatly improved the manuscript.